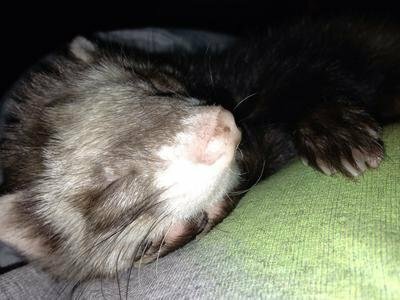 Mowgli is our first ferret and he is an absolute sweetheart. My kids love him and he is such a good sport. He likes to cuddle and his favorite place is in one of the drawers in my daughters trundle bed. He has done a fantastic job stealing our hearts! He IS absolutely adorable and is a complete sweetie... Never bites unless you let him under your covers. Any exposed human parts under the covers are fair game for nibbles!